After just one out of the three nights we spent here, we did not want to leave! The Nest was a super cozy little cabin with everything you could need for a weekend away. We stayed there for our anniversary, and had the peace and quiet to enjoy each other, as well as realize we are into bird watching through the big picture window. Hosts were kind to leave plenty of firewood, stocked kitchen utensils, and a clean welcoming home. The drive up is steep and would maybe be difficult with ice on there, but we have an AWD vehicle so it was a breeze. Getting into the driveway is only tricky the first time you do it. If youre looking for a luxurious cabin, this isnt for you. But if youre looking for a sweet little cabin to enjoy nature in, dont hesitate! We will definitely be coming back. I loved our stay at The Nest. It was nicely situated for exploring Shenandoah Natl Park, and was comfortably appointed. We really enjoyed sitting on the back deck and watching the birds at the feeders. Beautiful, peaceful setting. The house was comfortable for two people and cozy, and I would definitely consider staying there again if I visit the area in the future. 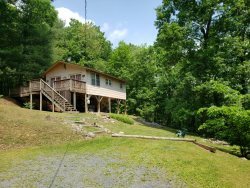 I was extremely pleased with the cabin and property. Everything was as promised and more. Notes were left for us, to help get acquainted with the kitchen and surrounding area. Brochures were in the coffee table to help with things to do. There was plenty of fire wood available for the fire pit and sitting area. I would go again and recommend this cabin. Very smooth process. Great cabin. Everything as promised. Will definitely use this service again. Part 2 of 2 It was really nice that it was in a wooded area and even while driving up the road to The Nest and you pass other lodges, we didnt feel close to them at all and we couldnt hear other people. The ample amount of firewood outside was great for us making a fire to make smores and just relaxing outside for countless hours at night. The grill was also a plus since we grilled out every day as well as the wood stove inside the house, which we made a fire in the last night to see how it worked! We enjoyed watching all the different birds outside that went to the bird feeder too :) Overall, this place was great and I would definitely recommend it to others to stay in or even coming back myself. Thanks for the great stay and for your great service Allstar Lodging! Part 1 of 2 Hello! We had a great time staying at The Nest while in the Shenandoah Valley. Our drive there was filled with beautiful views of the mountains and many cows, which we loved! We did get a little lost finding The Nest since our GPS said to go up a road and we crossed a railroad track and hit a dead end, but I called Allstar Lodging and they gave us directions until I lost signal and sure enough we found the house shortly after. The home itself was so great. Very cozy, neat, decorated beautifully, and they had amenities for us to use which was so handy and accommodating. Our four-legged friend loved the house as well and was able to roam outside and enjoy nature with the exception of a neighboring cat visiting a couple of times at night and she started to chase the cat down (dog habits!)! I dont think there is a bad thing to say about this house except that the shower was a little small, but it wasnt a concern for us.